Today’s mention is a little different because it’s not about what’s good for your business. Hummmm…. very mysterious! 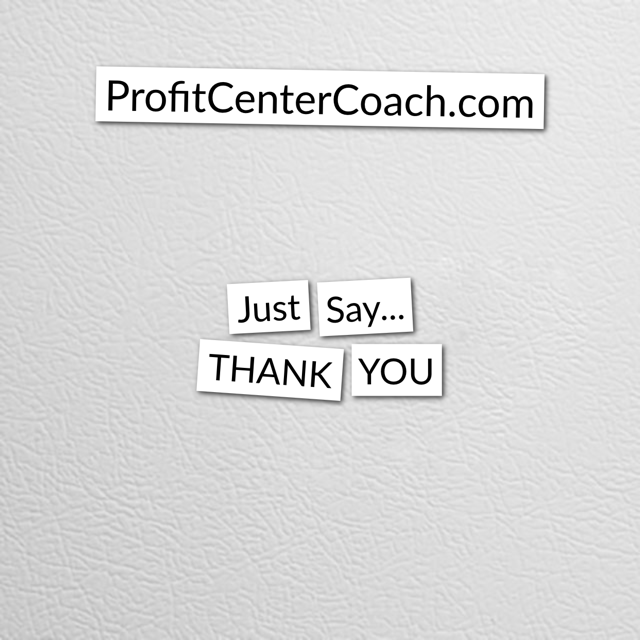 Who taught you to say “thank you”? I’m guessing a whole bunch of people like mom, dad, grandma (that’s usually a big one), grandpa, uncles, aunts… so what happened? Now you don’t say thank you??? When was the last time you simply went to your favorite store’s website, the store that consistently “does it right”, and thanked them. Who knows the reason, it could be the grocery store that carries your favorite cookies, but for some reason you enjoy going there. If I had to guess, it has been a long time, or you’re waiting for some really big reason to say thanks. Well… don’t you like to hear that you’re doing a great job? I mean, when you receive a simple email about how awesome your business is, don’t you print it up and put it on the wall? DO THIS FOR SOMEONE ELSE, SILLY. It doesn’t have to be a full review online (although that’s awesome), just take a moment to share your appreciation. This past week I was at #ICON17 a conference in Phoenix, and it didn’t take long to realize how super clean the bathrooms are in the convention center. I’m not kidding, spotless. The garbage was always under control. Soap, TP, and towels always stocked. Floors clean – and friendly staff! I appreciated it. So I sent a quick note on the website form… I have no idea if the right person will get it, I hope they do because you can be certain if the reverse were true, at least one person (probably more) would take time to complain. I’m encouraging you to start telling people what they’re doing right. We spend far too much time focused on getting “good reviews” from our customers when we don’t personally take time to give someone else positive credit. PS: Good online reviews don’t happen by accident, someone sat down and spent their time to acknowledge a success. When was the last time you simply said “hey you’re doing a great job” to your favorite business? Today, Just Say Thank You. 1- take 5 minutes to go to your favorite store’s website, find their email for online form, and just jot a note of why you think their so awesome. 2- For the over achievers… write another!